When walking through Chicago’s older neighborhoods, you can often find hints about the history of their buildings just by looking up. Geoffrey Baer looks back – and up – at some neighborhood architectural gems in this edition of Ask Geoffrey. I recently came across the building at 5043 S. Ashland, which has an elaborate inscription of “Heinemann Studio” over the door. What kind of studio was it? 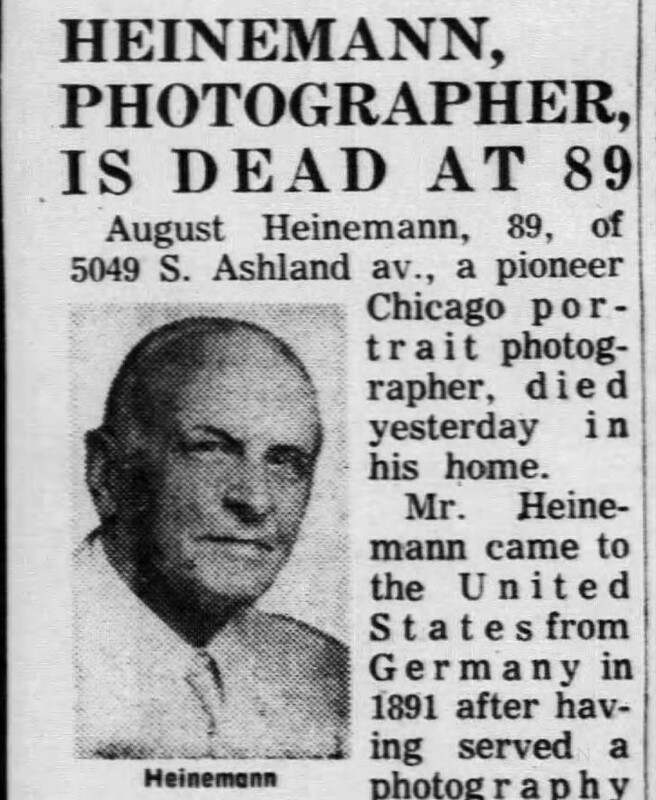 The building in the Back of the Yards neighborhood was a portrait photography studio that called itself the “Home of Famous Wedding Photographs.” It was owned and occupied by August Heinemann from 1925 to 1949. Heinemann was an early Chicago portrait photographer who born in Germany. A Chicago Tribune profile claimed he was the first professional studio photographer to hang out a shingle in Chicago in 1893. He emigrated from Germany to the U.S. in 1891 when he was 17 and began serving as a photography apprentice, learning how to make tintype photographs. At 19, he opened his own studio on South Ashland Avenue, just a block north of the building our viewer saw. His first customers were a newly married couple, and soon he was making hundreds of wedding and other kinds of portraits. In 1925 he had this studio built at 5043 S. Ashland Ave., where he said he and his assistants made two dozen wedding portraits every Saturday. Heinemann sold the business in 1949 when he retired (he and his wife had two daughters, but no sons to take over the business as was the custom at the time). A car dealership took over the studio, and later the tire shop that’s there today. And it turns out the famous wedding photographer had a wedding story of his own. He had been courting a young woman he met while apprenticing named Emma Schober. When he struck out on his own, he promised Emma that if his business was a success, they would marry. Three months after the studio opened, he made good on that promise. Emma Heinemann worked as the studio’s color artist. She must have been a good one, because according to her husband, other photographers tried to recruit her away to their studios before learning she was married to the owner. August and Emma were married for 69 years when he died at 89 in 1962; Emma died 12 years later in 1974. According to his obituary, August’s favorite thing to do during their travels was to make home movies to share with friends and family back home. I’m curious about some of the beautiful buildings on Lawrence around the Brown Line. Lawrence Avenue runs right through the heart of the Albany Park neighborhood at 4800 North, just a few blocks south of us at WTTW. Most of the beautifully detailed buildings our viewer admires were built in the years following the 1907 completion of the Ravenswood ‘L’ line to Lawrence and Kimball. The original station house, a stucco bungalow-like structure, was rebuilt in the 1970s. Today it’s the last stop on the CTA Brown Line. In a number of places around Chicago, the “L” sparked development of what were called the “bright lights” shopping and entertainment districts such as 63rd and Halsted in Englewood or Wilson and Broadway in Uptown. The area on Lawrence wasn’t as big or well known as those, but by the 1920s this stretch of Lawrence was a busy commercial area, and it still is today. One of the most striking buildings is the former car dealership at Lawrence and Whipple. It was built in 1925 for the Capitol Motor Sales Company in the days when car dealerships were more like showcases. Today, it’s a body shop. The former David Fireproof Storage and Warehouse towers over Lawrence a little west of Kedzie. It was built in 1916, one of a few the company built around the city. Many of corner buildings on Lawrence feature elaborate and detailed ornament, like the 1926 Willis Building at Lawrence and Sawyer that was once a shoe store, and is now a women’s clothing store. The 1933 building at Lawrence and Christiana might look familiar to faithful “Ask Geoffrey” viewers. We answered a question about it in 2015 – it was an L. Fish Furniture store. At the corner of Lawrence and Central Park is this two-level retail building with green accents built in 1933. It was a hardware and appliance store into the 1970s, and is now a home goods store. Our last stop is this 1923 Spanish Revival corner building at Lawrence and Avers. It’s been the site of all kinds of businesses, including a silk screen printer, an electronics store, and a table tennis club. Today, it’s a laundromat. 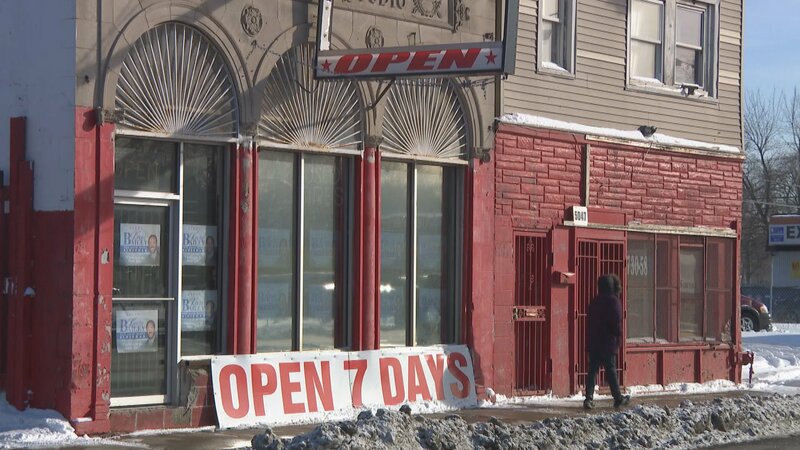 Albany Park has seen a lot of changes over the years since its beginnings as a farming community. It was annexed to Chicago in 1889. Swedes and Germans were the first to move in, but over the years, many ethnic groups made it their home including Jews and immigrants from Guatemala, the Philippines, the Middle East, and Korea. Today, it’s still one of Chicago’s most ethnically diverse neighborhoods.